The Battle of Chosin Reservoir, also known as Battle of Changjin Lake (simplified Chinese: 长津湖之战; pinyin: Cháng Jīn Hū Zhī Zhàn), was a battle in the Korean War in which 30,000 United Nations (UN) troops (nicknamed "The Frozen Chosin" or "The Chosin Few") under the command of American General Ned Almond faced approximately 150,000 Chinese troops of the People's Volunteer Army 9th Army Group under the command of Song Shi-Lun. 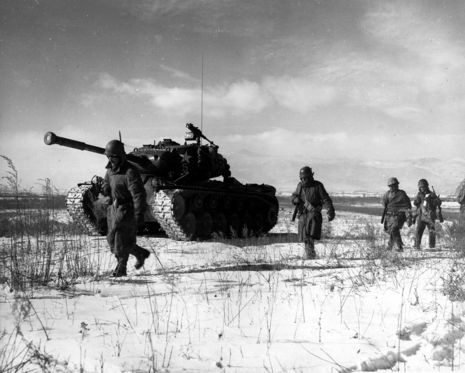 The name Chosin is the Japanese rendition of the Korean place name Changjin. The name stuck due to the Japanese names given to locations listed on maps used by UN forces. Shortly after the People's Republic of China entered the conflict, large numbers of Chinese soldiers swept across the Yalu River, encircling the UN forces in the northeastern part of North Korea at the Chosin Reservoir. A brutal battle in freezing weather followed. 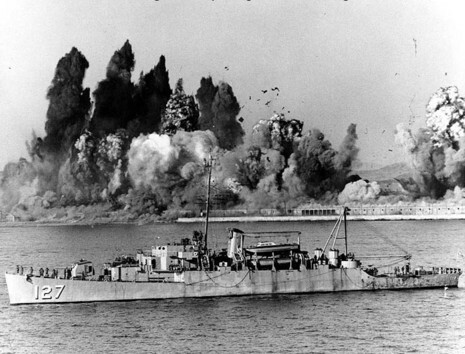 Although they inflicted enormous casualties on the Chinese forces, the UN troops were forced to evacuate North Korea after they withdrew from the reservoir to the port of Hungnam. the withdrawal to Hungnam through the protective lines of Task Force Dog, 3rd Infantry Division at Chinhung-ni. By shortly after midnight a confused battle was taking place all three 2 ID regiments were engaged but had been fragmented into company and part battalion sized units by infiltrating Chinese and were attacking units from all directions. Another CCF regiment infiltrated across the Ch'ongch'on River north of Kunu-ri and attacked the two reserve battalion 23rd and the three artillery battalions. This attack was turned but the Chinese withdrew to a mountain known as "Chinaman's Hat", located northeast of the 23rd but south of the rearmost positions of the 9th. Fighting tapered off at dawn but by noon word arrived that ROK II Corps 7th & 8th Divisions had been overrun and ROK II Corps was retreating in mass, thus making the 2 ID not only the flank unit for IX corps but also for Eighth Army. The route of ROK II Corps allowed the Chinese to infiltrate several regiments and turn them toward the mountains overlooking the road between Kunu-ri and Sunch'on, the 2 ID & Turkish Brigades withdrawal route. It also allowed the Chinese to attack down the road toward Kunu-ri. To counter these incursions, the 1st Cavalry Division moved to take up positions at Sunch'on and the road leading east from there. The Turkish Brigade received orders to move from Kunu-ri eastward to Tokch'on and clear the town. Far to the west in I Corps area the 24th ID was ordered to halt its advance and be prepared to withdraw back to the Ch'ongch'on. The same order went out to the ROK 1st Division. During the night the 25 ID had been hit by sharp but limited CCF attacks so managed to hold their positions.